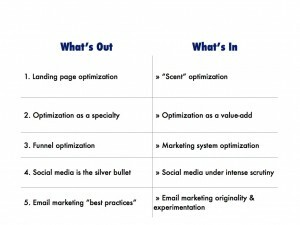 In January of 2010, I brazenly went out on a limb to make 5 predictions for that year in the marketing optimization industry. I think it will be fun to revisit them and see whether or not I’m the Nostradamus of Marketing. The online marketing world has changed a lot in some ways, and has hardly changed at all in others. Ultimately, this is a reminder to me that intuitions are just guesses, and if you’re really good, you’re right 51% of the time. Unfortunately, this concept hasn’t really caught on. I still feel that landing page optimization is too often done “in a vacuum” without paying enough attention to the scent of information. The very best optimizers in the industry are at least paying attention to entrance sources, and testing by those sources, but few seem to be thinking beyond the landing page to subsequent pageviews or return visits. Again, this concept hasn’t gained a lot of traction in the last 2 years. The optimization industry remains a specialty industry, and seems even more so as more and more individuals claim the expertise and hang out their shingle. I thought more optimization shops would be partnering with other service providers (or being acquired by them) in order to provide a wider service offering (e.g. eCommerce + Conversion Optimization). There seems to be some movement in this direction, so perhaps 2012 is the year. Wow, I’m starting to regret this whole “revisiting” thing! 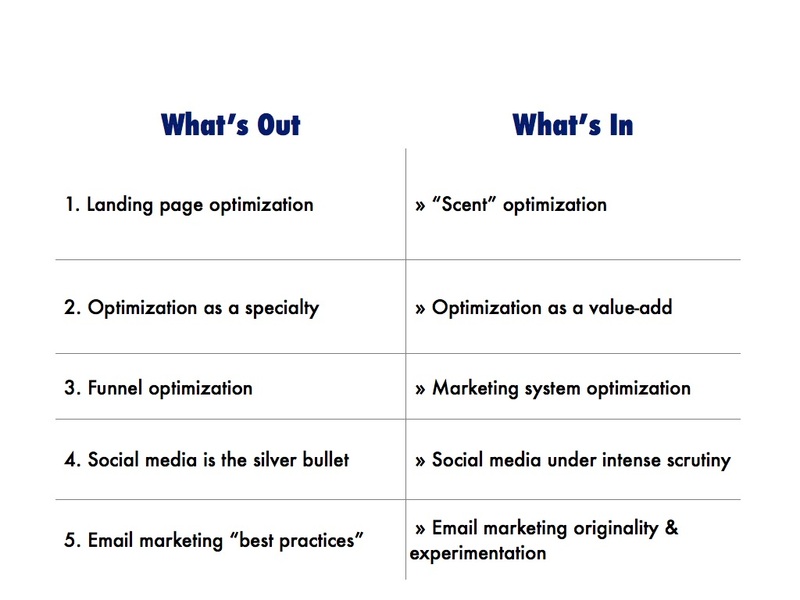 😉 Similar to #1, the focus seems to be stuck on tactical things like conversion funnels, and not enough strategic focus on how the whole marketing system works together and can be optimized from multiple directions at the same time. Ultimately, that’s what my new blog is about, so I’ll just keep writing posts until this concept takes off! Sheesh, I’m bad at this! While I’ve certainly seen a lot more about “social media roi” in the last couple years, “intense scrutiny” ended up being a huge understatement. And if I’m to believe Google Insights for Search as an indicator, interest is pretty flat! See chart. Does this mean that marketers feel like they’ve wrangled the Social Media Beast and are getting good ROI on their investments? In 2010, I predicted that because email had regained favor as a marketing “workhorse” that performed well, consistently, and predictably, marketers would start leaving the safety of “best practices” and start getting more creative with their campaigns and experiments. I admit that I’m not super plugged-in to the email marketing world, but anecdotally, I’ve not seen much creativity over the last 2 years, have you? Maybe this is because email is still viewed in that tactical sense that marketers need it to perform predictably, and don’t want to experiment in order to achieve compounding gains in ROI. As you can see, my predictions for online marketing in 2010 aren’t even true yet in 2012! Lesson learned: I will spend less time in 2012 predicting outcomes and more time working towards them. Do you have any thoughts on why these predictions did/didn’t come true? Is our industry slower moving and more entrenched than I believed? Have priorities shifted, especially given the situation with tablets and mobile? Or, does the average online marketer fear losing his/er job to begin with, and doesn’t want to “go out on a limb” like I did with my predictions? This entry was posted in email marketing, marketing optimization and tagged grokdotcom, marketing predictions, optimization predictions by brendanr. Bookmark the permalink.